On September 7, at 6:30 p.m. scholars Ren and Helen Davis will present “Landscapes for the People”. This presentation details the extraordinary work of George Grant, a master of photography who documented our nation’s natural treasures. A Pennsylvania native, Grant was introduced to the parks during the summer of 1922 and resolved to make parks and photography his life. Seven years later, he received his dream job and spent the next quarter century visiting the four corners of the country to produce images in more than one hundred national parks, monuments, historic sites, battlefields, and other locations. 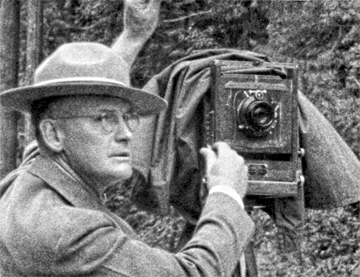 He was there to visually document the dramatic expansion of the National Park Service during the New Deal, including the work of the Civilian Conservation Corps. Grant’s images are the work of a master craftsman. His practiced eye for composition and exposure and his patience to capture subjects in their finest light are comparable to those of his more widely known contemporaries. Nearly fifty years after his death, it is fitting that George Grant’s photography be introduced to a new generation of Americans. George Alexander Grant is a little known elder in the field of American landscape photography. Just as they did the work of his contemporaries Ansel Adams, Edward Weston, and Eliot Porter, millions of people viewed Grant’s photographs; unlike those contemporaries, few knew Grant’s name. “Landscapes for the People” shares his story through his remarkable images and a compelling biography profiling patience, perseverance, dedication, and an unsurpassed love of the natural and historic places that Americans chose to preserve. This program has received funding from Utah Humanities (UH) and is free to the public. UH improves communities through active engagement in the humanities.